Desnivel Editions introduces one of his most human and emotional books ever: “The mountain can heal”, written by Víctor Riverola and Jordi Salvador, on sale at all major bookstores in Spain and worldwide through the Internet. The book was presented in Madrid on the 21st of May at Slope Library. During centuries, the mountain and the man have created a really interesting blend, not just as a sport, but also at a personal level. Each year we find more and more testimonies that narrate in great detail how the mountain has changed their lives, and in which way has helped them psychologically to overcome an illness, trauma, a physical pain or a psychological damage which were unable to surpass. Many doctors and specialists in oncology, psychiatry and trauma wonder how far the mountain can get to be therapeutic. Some of them assume that the mountain can definitely help overcoming important traumas. They even talk about cancer patients who have achieved a higher quality of life practicing sports in the mountain, even if at the end some of them failed to surpass the disease. Through four real case studies, Victor Riverola and Jordi Salvador introduce ourselves to the fascinating world of alpinism and mountain sports from a very personal point of view, in which the motivation, the desire to live and the human dramas that surround us have a big part in common. Together with other professionals and well-known doctors, the authors also analyse which are the different healing properties that the mountain hides inside. The first case concerns the personal adventure experienced by the climber Jordi Salvador after knowing that he was suffering from prostate cancer. The Aconcagua acted as a huge catalyst for emotions, helping him to be even stronger and overcome the disease. Then we discover how grandpa’s Antonio life changes when it seemed like he had no more chances to live. The mountain became the getaway that he needed in order to live the last years of his life with dignity. 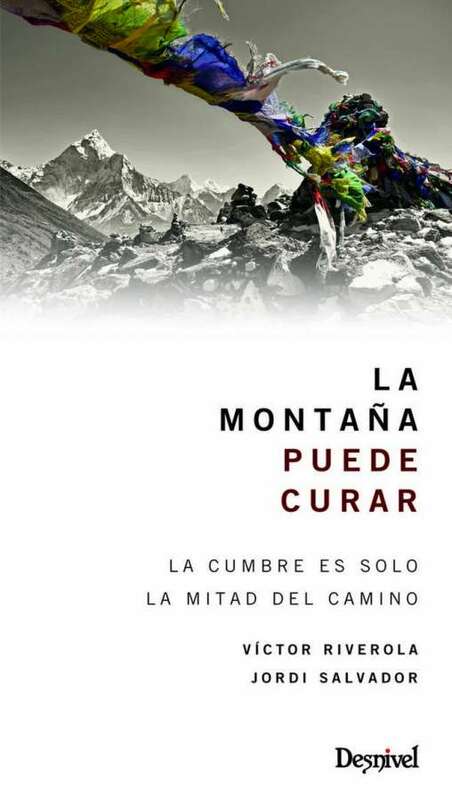 The third case relates the foundation of the Spanish Association of Alpinists with Cancer. The story is explained through the sharp and realistic look of its founder, a charismatic climber with a wide experience in the main mountain ranges throughout the world. The fourth and final case shows us how climbing can help to overcome the psychological scars that wars can cause, showing us how humans are able to fight their own ghosts , traveling from Afghanistan to the Swiss Alps. In the last pages of the book, we can find several witnesses that explain their personal experiences. They all have in common the fact that they had the opportunity to see with their own eyes situations where the mountain becomes “something else”. This part also includes an interview with the filmmaker Michael Brown. And just before the epilogue, the authors share with the reader their own conclusions and their personal opinion. – It is very important that each person that has got any type of illness or that is under any kind of medication realises the importance of doing outdoor activities, specially hiking, skiing, climbing or alpinism. These are sports that help with the healing process, that motivate the person and work out the muscles. These kind of sports provide endorphins, big doses of oxygen and a lot of vitality. – We live in a world where television abducts the whole society through empty messages and offering stupid pseudo-culture made for idiots. Referring to sports, the television covers only a very small part of the mountains sports, offering a very specialized TV programs that are suitable only for a small part of the audience. However, the cinemas present a more encouraging point of view, offering movies where climbing, skiing and adventure sports are shown in their glory. – War is a place where young people that don’t know and don’t hate each other, kill each other because of old people that know and hate each other, but they don’t kill each other. – The mountain, in contradistinction to other hobbies, passions, sports etc … is not something that can be mastered, it always ends up overpowering you, but the human is so small that from my point of view it’s almost impossible that man can come to dominate the mountain someday. Nowadays we reserve just a few time to contemplate small things that, in most of the cases, are the most beautiful ones. The mountain, like anything else in life, can be anything you want it to be, that’s why there are so many ways of enjoying the mountain and climbing such as styles of life you can get to imagine. That’s why, for those who ask me, “What can we find in the mountains?”, I would tell them that the mountain gives people motivation, peace and a substantial dosage of inspiration but, as happens with most of the things that you undertake in your life, if somebody decides to start or keep practicing mountains sports in order to improve their lives, I would tell them that they have to do it with a very opened mind, dedicating their energy to it and being willing to receive from this activity whatever it has to offer, without creating too much previous expectations so that they can express which positive contributions they get from this activity. – We are completely convinced that the mountain has got the power to heal, but we invite you not to thing in the healing itself, but in the willing to live, to fight, to progress, to improve, to make something together with the nature that spreads out our heart and releases our soul. We can feel like more or less ill, or completely healthy, but the most important thing is to be aware of the contributions of the mountain. The reason: it doesn’t matter, eat your favourite food in a shelter, forget about world and just enjoy, sit under a tree and appreciate the view, lay in the grass and watch the sky, look for mushrooms, go for a walk as a couple, climbing, etc. Every weekend you can see thousands of people running away from the big cities looking for that I-don’t-know-what, but the truth is that the mountain converts people in different human beings, even in winter, when the skiers come back to their homes feeling new, as if they just born. Everybody comes back home in another mood, with a different motivation. Comparing this effect to a patient’s case, even if the person is at a very serious stage of the illness or recovering, the therapeutic effects of the mountain are invaluable. Therefore we can affirm that the mountain heals, making possible to acquire a much more positive mood. – Scientifically, there is no proof of the existence of a direct link between an illness, the healing and mountains sports (or any other sports). However, many doctors affirm that the patient’s mood and motivation have strong influence in the healing progress and affects the outcome of the treatment and the subsequent recovery. The mountain predisposes our body in order to multiply the effects of the medication. Every place where we go has got unique properties. – Our lives have become digital, our friends have become virtual, and we have almost everything we want to know through a simple click in our computers. Experiencing the world through second hand information is not enough. If we want authenticity, we have to produce it, create it, and invent it. – We will never know how strong we are unless we get in a situation in which we are forced to discover it. We are talking about the self-discovery, the one that takes us to the wildest and most gorgeous places in the Earth. – Giving up is the first way to loose. – If they tell you, you forget. If you see it, you remember. But if you do it, you learn it. Thanks Ana for this amazing translation.